Faulconer to Defend Free Trade, NAFTA at Mayors Meeting in D.C.
Mayor Kevin Faulconer departed Tuesday for a three-day trip to Washington, D.C., where he plans to advocate for modernization of the North American Free Trade Agreement and increased funding to combat homelessness in the region. Faulconer will attend the U.S. Conference of Mayors’ annual winter meeting, the agenda for which includes discussions of immigration, NAFTA, job creation and homelessness. San Diego’s mayor also is set to moderate a panel discussion on trade, speak on ending homelessness among veterans and participate in a session on new energy technologies and partnerships. Faulconer’s schedule includes a meeting with mayors from Phoenix, Nashville and Fort Worth, and with Mexico Ambassador Geronimo Gutierrez. He has three meetings scheduled with federal officials to advocate for more homelessness funding, according to the mayor’s office. He will also attend a meeting on NAFTA with Tijuana Mayor Juan Manuel Gastelum. 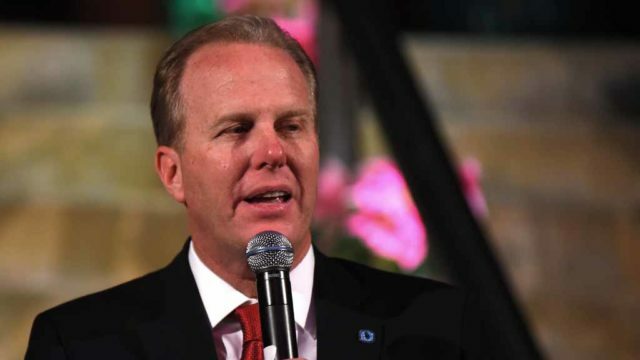 While President Donald Trump has repeatedly derided and threatened to withdraw from the NAFTA trade accord with Canada and Mexico, Faulconer, a Republican, disagrees with that stance. Meanwhile, more than 33 million people crossed the border at San Ysidro in 2015, making it the busiest border crossing in the western hemisphere, according to federal data. Other Southern California mayors expected to attend the conference are Eric Garcetti of Los Angeles, Donald P. Wagner of Irvine and Tom Tait of Anaheim.